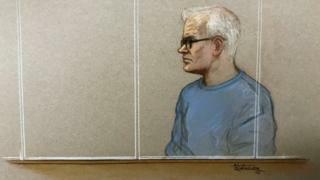 The mystery Hatton Garden raider known as "Basil" could be a foreign criminal linked to a £86m diamond vault heist in Belgium, a court has heard. But at his trial, his defence lawyer said police should look to Europe to find the guilty man. A police detective said no evidence suggests Basil is not English. Mr Seed is alleged to be Basil, who also carried out a £1m burglary at Bond Street jewellery store Chatila with some of his fellow Hatton Garden raiders five years earlier, the court has heard. Det Con Matthew Hollands, of the Metropolitan Police, said he has found no evidence of crimes using similar methods in the UK. But Richard Sutton QC, defending Mr Seed, said police should have widened the search "about 100 miles into the continent of Europe". He asked Mr Hollands: "Did you know there was a radar diamond vault in Antwerp in 2003 where over 100 million euros (£86m) of jewels were taken?" He said another raid in Antwerp earlier this month involved burglars "tunnelling underground" and emptying 30 safe deposit boxes. "Looking at who Basil might be, you suggest he would have to be English," he told Woolwich Crown Court. Mr Hollands said the best description of Basil came from secret audio recordings of the other Hatton Garden raiders. He said: "I'm not aware of any passage which suggests he's not [English]. It was not a European team who did this." Mr Hollands said Mr Seed was "shocked" and "shaking" when police raided his one-bedroom flat in north London last year. Brian Reader, 79, John Collins, 78, Daniel Jones, 63, Carl Wood, 61, have been convicted of conspiring to carry out the burglary in Hatton Garden along with Terry Perkins, who died last year. The probe into the heist revealed some of the same men committed the "strikingly similar" burglary of the Chatila store, the court heard previously.